The captain of the ship ‘Fortune’ offers you to go aboard. 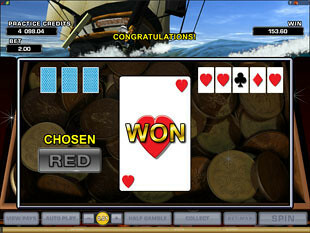 To make an unforgettable gambling voyage to the magical land of money winnings and bonus games. 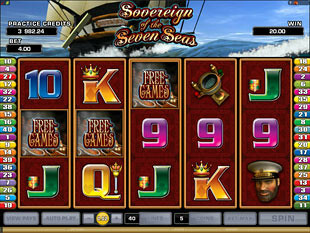 Play Sovereign of the Seven Seas slot machine released by Microgaming and find the way to this fabulous place. Where the countless riches are hidden and wait for their worthy owner! To open the ancient chests with the valuable gold coins, spin the enchanted 5 reels and catch the cash prizes on all 40 paylines. Enjoying this slots in a no download version as well, you may sail to the top naval jackpot of $1,250, the enticing Bonus Game, the superb Double Up Feature and the unique scatter gift of $20,000 to boot. Choose one of the best Microgaming casinos to play for real and all these awards will be yours! What can bring you the extra head-spinning slots coins during the exciting trip? It is Nordic Girl acting like the Wild symbol. This icon has the power to replace any other symbols with the exception of the Scatters. Emerging on the 2nd, 3rd or 4th reels and completing the winning combinations, Nordic Girl image expands and makes the whole reel wild. Find this wild feature in the main game and within Free Spins. Not to let the pirates board your ship, benefit from the hard-hitting Cannons. As they are the Scatter symbols. Collect 5 Cannon pictures at a time to make the exterminatory explosion and gain the incredible scatter prize of $20,000. 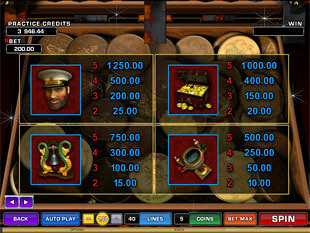 3, 4 or 5 Cannons can also subdue the reels’ resistance and trigger the exclusive Bonus Game. Take delight in it selecting your deserved Free Spins and multipliers as well. To discover the right location of the treasures, fix the coin value and bets to gamble with. As for coin sizes, they vary from $0.01 to $1.00. Moreover, each payline accepts up to 5 coins. Note that any change in the number of coins or their denomination will modify your stake. So, the video game offers you to spin the reels with the minimum bet of $0.40. At the same time, you may risk gambling with the largest bet that is equal to $200. 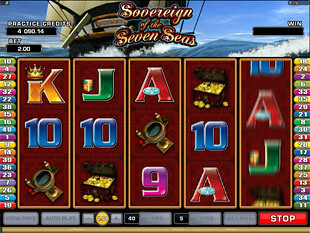 Wait for the luck to face you and award with the highest sea jackpot of 1,250 coins or $1,250. However, you need to allure your good fortune first. Putting $200 per spin and trying to get 5 Captain images on the slots screen. You can call Stop Feature for help. As it is able to bring the reels to a stop whenever you like. Look out! There can be the Bonus Game on the starboard bow if you hit 3 or more Cannon symbols simultaneously. Got it? 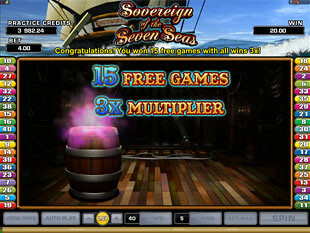 Then, choose a barrel out of 3 offered and win the certain number of Free Spins and the multipliers into the bargain. While playing Free Spins Feature, you can be really lucky to add more Free Spins to your account and get much more cash thereby. Can you hear the Captain ringing a ship bell? It means it’s high time to spin the reels and hunt for the Bonus! The wins during the base game can activate the Double Up Feature. To get lots of slots credits here, try to guess the right colour or suit of the card. Clicking on the winning colour, your money prize is doubled. The correct choice of the suit increases your stake by 4 times. Feel free to collect the sum won any time until you reach the Gamble Limit. 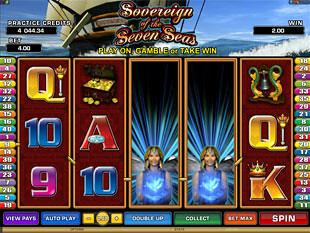 Catch the gambling wave of Sovereign of the Seven Seas slot machine. Offering you a great deal of winning combinations, this new Free Spins slots gives you a perfect chance to seize the lucrative bonuses and presents with every spin. Ready to subdue the water and gambling elements? So, the sea adventures can start right now!